Increase the quality of existing early learning programs by promoting the development and adoption of comprehensive, evidence-based instructional models that improve young children’s language, literacy, numeracy, and socio-emotional skills. Every Child Ready is a preschool instructional model developed by AppleTree Institute for Education Innovation (AppleTree) based in Washington DC. Every Child Ready is designed to close the achievement gap between “at-risk” three- and four-year-old children and their more advantaged peers. The model is unusual in that it not only provides a comprehensive approach for teaching preschoolers, but it is also rigorous in measuring outcomes. AppleTree opened its first preschool in 2005 and spent six years developing the Every Child Ready model that officially debuted in 2011. As of 2016-17, AppleTree educates approximately 1,200 children at ten charter preschools in high-need neighborhoods. It has reached an additional 1,000 children through nine partner schools and community-based organizations throughout the District of Columbia, as well as one in New York City. What to teach: The Curriculum has 10 thematic units designed to meet the learning needs of three- and four-year-olds. Each unit covers topics like family and community, color and art, earth science, or space and astronomy, and is aligned to both the Common Core and DC Early Learning standards. How to teach: The “Attributes Framework” provides teachers with checklists and resources to support including evidence-based instructional practices in each of their lessons (e.g. a community building activity, language support strategies, or behavior management strategies). How to tell it’s being done: The “Quality Indicator Observational Tool” helps teachers and preschool leaders translate classroom quality data into practical feedback to improve teaching quality. Using this tool, teachers can identify their strengths and weaknesses, better preparing them to select appropriate professional development workshops and use one-on-one coaching to improve their teaching. AppleTree has also developed progress monitoring tools for critical skills: Every Child Ready Language and Literacy, Every Child Ready Math, and the Positive Behaviors Rating Scale. Provide at least two meals per day (particularly important for children coming from food-insecure households, who may arrive hungry). 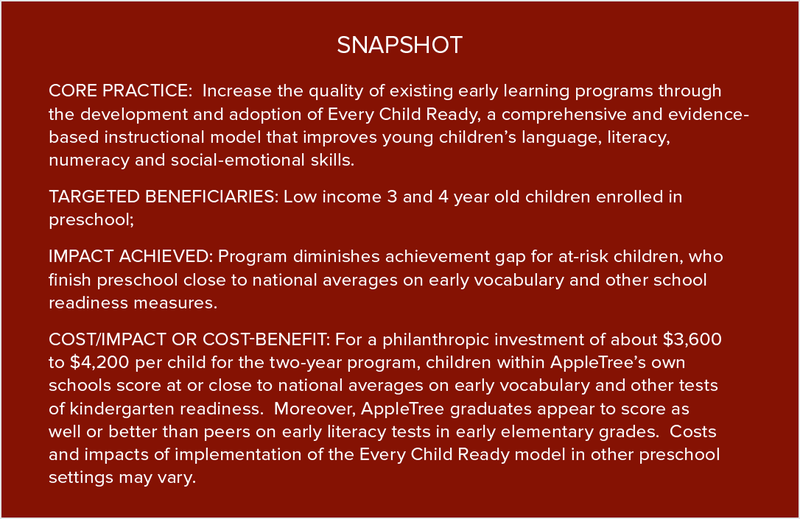 Exposure to the Every Child Ready model diminishes the achievement gap in early vocabulary, literacy, and math skills for at-risk children in AppleTree schools according to data from AppleTree’s 2011-2013 i3 evaluation study. Ninety percent of these children completed preschool scoring within “normal” ranges on commonly used tests of key language, vocabulary, or literacy skills and, as a result, are much less likely to be assigned to special education or held back a grade level. A study of AppleTree alumni conducted just before Every Child Ready’s official rollout in 2011 found that AppleTree graduates in the early grades of district public schools were performing as well or better on average than their peers on common literacy measures. In the long term, according to other longitudinal studies, early success in these areas has been linked to lower rates of high-school dropout, behavior issues, crime, and unemployment, among other outcomes. The 2011 study of 100 AppleTree alumni suggests that graduates are performing on average as well as or better than their peers once they enter elementary school.9 Based on scores from early literacy tests administered by District of Columbia Public Schools (DCPS), AppleTree alumni on average enter kindergarten with stronger letter recognition skills than the average DCPS student, and maintain that gain throughout the year. AppleTree graduates also showed stronger oral reading skills in first grade than the average DCPS student, scoring almost 30% higher. The sample size for 2nd grade was too small to draw firm conclusions, but there was no evidence of a “fade-out” effect: AppleTree students did not appear to lose their advantage in oral reading skills. Because the Every Child Ready instructional model is fairly new, evidence of this specific program’s long-term impact has not been measured through a longitudinal study. AppleTree’s initial success, however, has attracted the attention of peer schools, researchers, and funders: In 2012, New Schools Venture Fund selected Every Child Ready as a “turnaround strategy” for improving preschool programs in several other Washington DC-based schools. While it is difficult to isolate the impact of the model in these additional schools without a robust evaluation, the data appear to point in the right direction: other schools and learning centers that have implemented the full Every Child Ready model also show positive growth rates in children’s learning. Funders can help underwrite AppleTree Institute’s implementation of Every Child Ready within their Washington DC charter preschools. It costs about $35,000 to educate a disadvantaged preschool child for two years using the Every Child Ready model in AppleTree-run schools. Much of this cost is covered by the per-pupil funding allocation from the school district, DCPS. In the 2014-15 school year, for example, DC allocated $15,400 and $15,700 per three and four-year-old student to charter preschools (including AppleTree schools). The cost gap – ranging from $3,600 to $4,200 per pupil – is filled by philanthropy. Funding AppleTree directly also supports ongoing research, development, and evaluation of the Every Child Ready model.11 Currently, AppleTree Institute is keenly interested in conducting a third-party evaluation of Every Child Ready’s effect on children’s third grade reading and math scores. Alternatively, funders can help bring Every Child Ready to preschools outside the AppleTree network, including those operated by public school districts, community based organizations and charter schools. Implementation costs for Every Child Ready in this context vary depending on school size and the degree to which the school will need to supplement or upgrade its basic level of staffing and resources. AppleTree offers a set-up package of Every Child Ready books, supplies and online services for $5,000 for a classroom of 20 to 25 children. In subsequent years, the cost is $2,500 per classroom and includes the curriculum, assessment and reporting, and year-round support for professional development. These costs should be considered minimums, however, as schools also may need to purchase other books and materials, as well as technology (such as tablets), from third-party vendors to make full use of Every Child Ready. It is also important to note that, in order to implement the model with fidelity, a preschool’s costs can increase to accommodate the operational recommendations mentioned previously (e.g. hiring lead teachers with a bachelor’s degree, providing full-day programs, etc.). A philanthropic investment of approximately $3,600 to $4,200 provides an at-risk child with two years of exposure to the Every Child Ready model within AppleTree’s own schools. 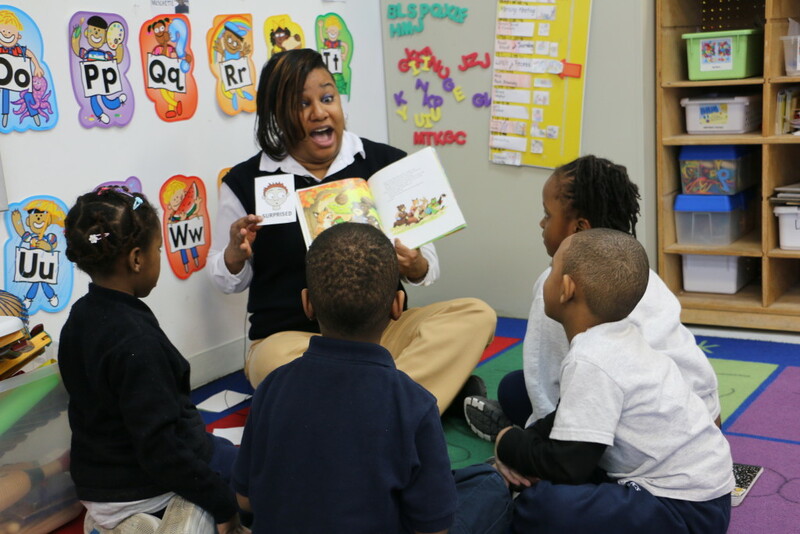 Mid-term: A 2011 study showed that AppleTree’s graduates scored at grade level in early elementary school; their early literacy skills were better on average than the average DC public school student. Long-term: Based on evidence from similar high-quality early childhood programs, AppleTree students may see an increase in school achievement and income, better health, and a decrease in unemployment. Take Action: Donors can support AppleTree directly, or can support the adoption and further evaluation of the Every Child Ready model in additional partner schools. 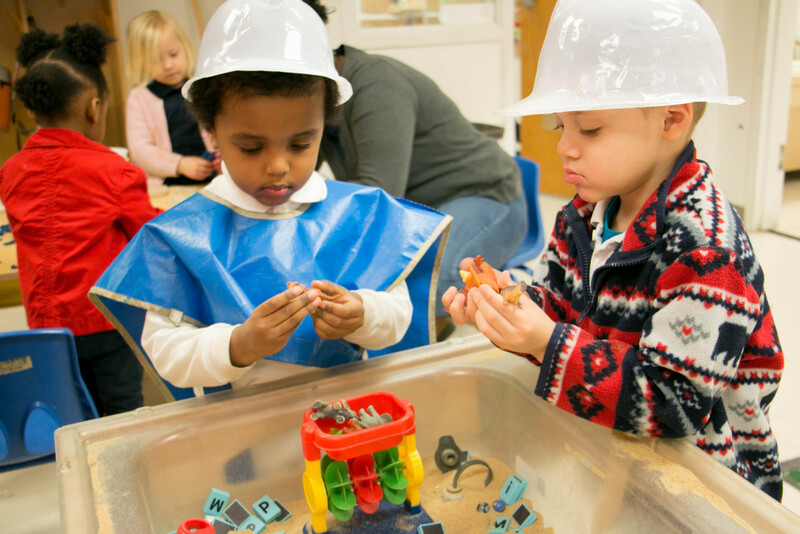 Donors interested in further rigorous evaluation of whether the adoption of instructional packages such as Every Child Ready can improve the quality of existing preschool programming can also contact New Profit, which is helping to coordinate donors interested in this approach. 1 See: A Matter of Equity: Preschool in America. U.S. Department of Education, 2015 (retrieved: 11/19/15 at: https://www2.ed.gov/documents/early-learning/matter-equity-preschool-america.pdf Also: Nores, M., & Barnett, W.S. (2014). Access to High Quality Early Care and Education: Readiness and Opportunity Gaps in America (CEELO Policy Report). New Brunswick, NJ: Center on Enhancing Early Learning Outcomes. 2 Two notable examples are the Abecedarian project and the Perry preschool project. 3 Because AppleTree’s preschools are technically charters, they cannot select children based on income levels (there is a lottery). Because their schools are located in predominantly low-income areas, however, the percentage of children receiving free or reduced lunch (an indicator commonly used as a stand-in for low income) hovers around 80%. Also, approximately 38% of their children do not speak English as a first language (ELLs). 6 At or under mean of 85. 7 Students scoring low on baseline assessments of the PVVT increased scores by just under 30% by the end of the program. 10 See, for example, results from the Perry Preschool program and the CPC program also profiled in this toolkit. 11 For example, AppleTree has raised $3.5 million from the Stranahan Foundation, Venture Philanthropy Partners, New Schools Venture Fund, the Marriott Foundation and the Martin Family Foundation to put Every Child Ready onto a technology platform so it is truly scalable and easier to use. 12 AppleTree does not at this point have the tracking information to know what percent of their graduates have been assigned to special education, although they do know that less than 5% have been retained. Information on cost supplements for DC special education is available at: https://www.dcfpi.org/wp-content/uploads/2015/03/Revised-School-Primer-March2015-FINAL.pdf; percentage of special education assignments is available at the DC public schools website: https://dcps.dc.gov/node/966292 Range in per-pupil special education supplements reflect higher degree of need for support while in school.